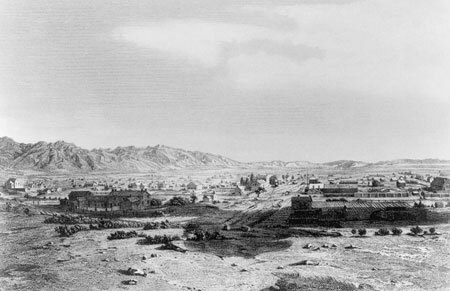 Having successfully brought the first company of Saints across the plains to Utah, President Brigham Young now turned his attention to establishing God’s kingdom in the desert. Through his vision and leadership, what was once an empty desert became a thriving civilization and a haven for the Saints. His plainspoken direction helped the Saints imagine the possibilities of their new home and led them forward in their quest to build God’s kingdom. President Young’s first public act, on 28 July 1847, was to select a central site for a temple and put men to work planning its design and construction. Placing his cane on the chosen spot he said, “Here we shall build a temple to our God.” This declaration must have comforted the Saints, who only a short time before had been forced to discontinue temple worship when they left Nauvoo. In August, Church leaders and most of the first pioneer company returned to Winter Quarters to prepare their families to come to the valley the next year. Shortly after they arrived, Brigham Young and the Quorum of the Twelve felt impressed that the time had come to reorganize the First Presidency. As President of the Quorum of the Twelve, Brigham Young was sustained as the President of the Church. He chose Heber C. Kimball and Willard Richards as his Counselors, and the Saints unanimously sustained their leaders. “By the time the grass began to grow the famine had waxed sore. For several months we had no bread. Beef, milk, pig-weeds, segoes [lily roots], and thistles formed our diet. I was the herd-boy, and while out watching the stock, I used to eat thistle stalks until my stomach would be as full as a cow’s. At last the hunger was so sharp that father took down the old bird-pecked ox-hide from the limb; and it was converted into most delicious soup.”2 The settlers freely cooperated and shared with each other and so were able to survive this difficult time. By June 1848, the settlers had planted between five and six thousand acres of land, and the valley began to look green and productive. But to the Saints’ dismay, huge hordes of black crickets descended upon the crops. The settlers did everything they could. They dug trenches and turned streams of water on the crickets. They clubbed the insects with sticks and brooms and tried to burn them, but their efforts were useless. The crickets continued to come in seemingly endless numbers. Patriarch John Smith, president of the Salt Lake Stake, called for a day of fasting and prayer. Soon large flocks of seagulls appeared in the sky and descended on the crickets. Susan Noble Grant said of the experience: “To our astonishment, the gulls seemed almost ravenous while gobbling down the scrambling, hopping crickets.”3 The Saints watched in joy and wonderment. Their lives had been saved. In the late summer of 1848, President Brigham Young again made the journey from Winter Quarters to the Salt Lake Valley. When he arrived, he realized that the Saints needed to learn what resources were available in their new environment. Much was gained from Indians who lived in the area, but President Young also sent Church members on explorations to discover the medicinal properties of plants and the natural resources available. He sent other exploring parties to find settlement sites. In their travels these members discovered mineral deposits, abundant timber, water sources, and grasslands, as well as suitable areas for settlement. To guard against land speculation, the prophet warned the Saints against cutting up their assigned property to sell to others. The land was their stewardship and was to be managed wisely and industriously, not for financial gain. In the fall of 1849, the Perpetual Emigrating Fund was established under the direction of President Young. Its purpose was to assist the poor who did not have the means to travel to join the body of the Church. At great sacrifice, many Saints contributed to the fund, and as a result, thousands of members were able to travel to the Salt Lake Valley. As soon as they were able, those who received help were expected to repay the amount of assistance they had received. These funds were used to help still others. Through this cooperative effort, the Saints blessed the lives of those in need. With the hum of labor and domestic life filling the air, President Brigham Young turned to the concerns of the Church. At the general conference held on 6 October 1849, he assigned several members of the Twelve, along with newly called missionaries, to serve foreign missions. They accepted these calls even though they would leave behind their families, their new homes, and many unfinished tasks. Erastus Snow and several elders opened missionary work in Scandinavia, while Lorenzo Snow and Joseph Toronto traveled to Italy. Addison and Louisa Barnes Pratt returned to Addison’s former field of labor in the Society Islands. John Taylor was called to France and Germany. As the missionaries traveled east, they passed Saints headed to the new Zion in the Rocky Mountains. In August 1852, at a special conference held in Salt Lake City, 106 elders were called to go on missions to countries throughout the world. These missionaries, as well as those who were called later, preached the gospel in South America, China, India, Spain, Australia, Hawaii, and the South Pacific. In most of these areas, the missionaries had little initial success. However, they sowed seeds that resulted in many coming into the Church in later missionary efforts. For those who joined the Church outside the United States, this was a time for gathering to Zion, which meant traveling by boat to America. Elizabeth and Charles Wood sailed in 1860 from South Africa, where they had labored several years to acquire money for their travel. Elizabeth kept house for a wealthy man, and her husband made bricks until they obtained the needed funds. Elizabeth was carried aboard the ship on a bed 24 hours after delivering a son and was given the captain’s berth so she could be more comfortable. She was very ill during the journey, almost dying twice, but lived to settle in Fillmore, Utah. Many communities in Utah and southern Idaho and later in parts of Arizona, Wyoming, Nevada, and California were founded by individuals and families called at general conferences. President Brigham Young directed the establishment of these communities, where thousands of new settlers could live and farm. During his lifetime, all of the Salt Lake Valley and many surrounding areas were colonized. By 1877, when Brigham Young died, more than 350 colonies had been established, and by 1900 there were almost 500. Early Church authority Brigham Henry Roberts noted that the success of Mormon colonization stemmed from “the loyalty of the people to their leaders and [their] unselfish and devoted personal sacrifice” in carrying out their calls from President Young.9 The colonists sacrificed material comforts, the associations of friends, and sometimes their lives to follow a prophet of the Lord. At general conference meetings, President Young read the names of those brethren and their families who were being called to move to outlying areas. These colonizers considered that they were being called on missions and knew that they would remain in their assigned locales until they were released. They traveled to their new areas at their own expense and with their own supplies. Their success depended on how well they used the resources at hand. They surveyed and cleared fields, built gristmills, dug irrigation ditches to bring water to the land, fenced pastures for their stock, and built roads. They planted crops and gardens, built churches and schools, and tried to maintain friendly relations with the Indians. They helped each other in sickness, as well as in births, deaths, and weddings. “There have been many hardships. That I admit … and these we have shared together. But if you want to go somewhere else, that is your right, and I do not want to deprive you of it. … But I must stay here, even if I stay alone. President Young called me here, and here I will remain till he releases me and gives me leave to go.” Brother Rich and his family did stay, and he became the leader of a thriving community for the next several decades.11 Like thousands of others, he willingly obeyed his leaders in order to help build the kingdom of the Lord. As colonists moved further into the frontier, they often had dealings with the Indians. Unlike some settlers of the West, President Brigham Young taught the Saints to feed their native brothers and sisters and try to bring them into the Church. Proselyting efforts among the Indians were tried at Fort Lemhi in the Salmon River region of Idaho Territory and in the Elk Mountain settlement on the upper Colorado in the Utah Territory. President Young also instituted Relief Societies whose members sewed clothing for their Indian brothers and sisters and raised money to help feed them. In his later years, President Young clarified and established some important priesthood responsibilities. He directed the Twelve to hold conferences in every stake. As a result, seven new stakes and 140 new wards were created throughout Utah. The duties of stake presidencies, high councils, bishoprics, and quorum presidencies were clearly defined, and hundreds of men were called to fill these positions. He counseled Church members to put their lives in order and pay their tithing, fast offerings, and other donations. In 1867 the prophet appointed George Q. Cannon as general superintendent of the Sunday School, and within a few years, the Sunday School was a permanent part of the Church organization. In 1869 President Young began giving formal instruction in modest living to his daughters. He expanded this counsel to all young women in 1870 with the formation of the Retrenchment Association (retrench means to cut back excesses). This was the beginning of the Young Women organization. In July 1877 he traveled to Ogden, Utah, to organize the first stake Relief Society. As a leader, President Brigham Young was practical and energetic. He traveled to the settlements of the Church to instruct and encourage the Saints. By direction and example, he taught members to fulfill their callings in the Church. In August 1877, President Young fell very ill, and in spite of physicians’ care, died within a week. He was 76 years old and had led the Church for 33 years. Today we remember him as the dynamic prophet who led modern-day Israel to their promised land. His sermons touched on all aspects of daily life, making clear that religion is part of everyday experience. His understanding of the frontier and his sensible guidance inspired his people to accomplish seemingly impossible tasks as with the blessings of heaven they created a kingdom in the desert. See Journal of Discourses, 13:85–86. John R. Young, Memoirs of John R. Young (1920), 64. Carter E. Grant, The Kingdom of God Restored (1955), 446. Quoted in B. H. Roberts, Life of John Taylor (1963), 202. Francis M. Gibbons, Lorenzo Snow: Spiritual Giant, Prophet of God (1982), 64. “The Church in Spain and Gibraltar,” Friend, May 1975, 33. R. Lanier Britsch, Unto the Islands of the Sea: A History of the Latter-day Saints in the Pacific (1986), 21–22. Charles W. Nibley, “Reminiscences of President Joseph F. Smith,” Improvement Era, Jan. 1919, 193–94. Quoted in Russell R. Rich, Ensign to the Nations (1972), 349. Diary of Charles Lowell Walker, ed. A. Karl Larson and Katharine Miles Larson, 2 vols. (1980), 1:239; spelling and punctuation modernized. Leonard J. Arrington, Charles C. Rich (1974), 264. Elizabeth Wood Kane, Twelve Mormon Homes Visited in Succession on a Journey through Utah to Arizona (1974), 65–66. Quoted in Gordon B. Hinckley, Truth Restored (1979), 127–28. Brigham Young, in Journal of Discourses, 18:233.